We talk about pushing “one hundred percent” in racing a lot. I think it is often overlooked just how hard that is to do, and just how often we mistake ninety-nine percent for a hundred. I saw two men both give a hundred percent in detestable conditions, just a few weeks ago. It was the race of the decade. It was American Flat Track. I will never forget it. And here it is, video evidence that what I witnessed in Santa Rosa was not a hallucination. We jump in for the final three laps to decide the AMA Pro Flat Track GNC1 champion. Jared Mees, holding the #1 plate on the Rogers Racing Harley-Davidson, has spent half the race catching Bryan Smith #42 on the Crosley Brands Kawasaki. Brad “the Bullet” Baker is now ten seconds ahead taking an easy race win (seriously, could you make it look any easier), so you are actually watching the battle for second place. 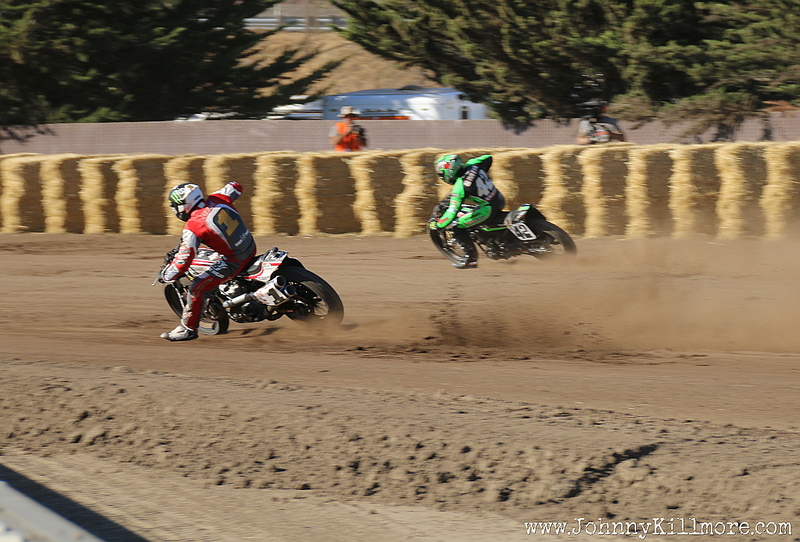 However, these two lions are fighting track conditions- and each other- for the GNC1 title, not a race win. Smith leads by two points and and there is a three point difference between second and third place: that’s simple math. Finish in front, get the title. Push the button, get the cheese. Too bad the button is coming at you swinging a baseball bat. Dig in your heels and open the throttle. There is only one way out of this mess. At one point Mees (1) was half a straightaway behind Smith (42). Here, with two laps to go, he trails by a few yards. Smith said after the race his hand grips were coming off the handlebars, his feet were bouncing off the pegs. He required a bottle of water to flush dirt from his eyes before he could even be interviewed. In these tough conditions, Mees made a determined charge as Smith fought fatigue and the sweat/dirt in his eyes, with the entire year’s effort being decided in the final yards of competition. You can’t write a better script folks. FansChoiceTV has the entire main event available for streaming on their website… for free. You’re welcome. AMA Pro Flat Track has relaunched their brand as the American Flat Track series. Make note of it so you don’t miss any action as the season ramps up next year.